“Ipiprito mo ba ako o ilalaga?” (Are you going to fry or stew me?) he asked as he walked in. The assembled TV crew laughed, albeit nervously. The question signalled the beginning of the unexpectedly light-hearted interview of billionaire David M. Consunji by Prof. Solita Monsod for her program, Bawal ang Pasaway Kay Mareng Winnie. 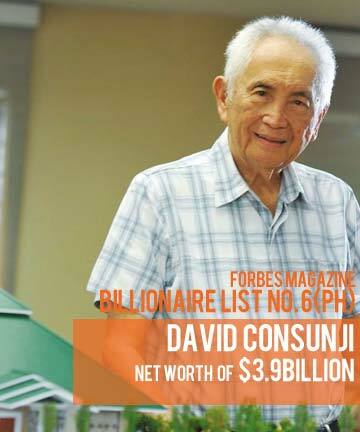 Just two weeks ago, the 91-year old Consunji who founded the company DMCI was named the fifth richest Filipino by Forbes magazine. Aside from keeping his nose clean, Consunji remains humble. He credits his children for persuading him to change the structure of his company and diversify, venturing into mining, water, forestry, and other businesses. He credits his friends, classmates and employees for keeping DMCI strong. He says this was how the Consunji family’s worth rose from $210 million in 2007 to $2.78 billion in 2012. But to the old Consunji, there are things that should remain constant. For one, being thrifty – Consunji still lives in the house he had built for his family in 1971. “I never changed my lifestyle,” he said, despite the tremendous growth of his wealth from zero to 12 zeroes – and in dollars. Their dining table fare remains simple: corn flakes for breakfast, and paksiw na bangus or torta for lunch. “Ubus-ubos biyaya, bukas nakatunganga,” his uncle once warned him, referring to other young men who blew their pay on liquor on payday weekends and were unable to show up for work on Monday. Another constant is his belief that one must be a good guy to make money. “I think I am making my parents happy. They taught me that honesty is the best policy,” he said. But the biggest constant in Consunji’s life is his passion to build. He is rich because of the money that is the byproduct of this passion. Consunji built the Chapel of the Holy Sacrifice, the Cultural Center, the Folk Arts Center and many others. He is also generous with his knowledge. While others balk at sharing information with builders who may rival them in the future, Consunji shared knowledge with younger engineers. ” Tuturuan kita, at kasalanan ko na kapag hindi ka natuto,” he often told his mentees. And then there’s his humor. When asked how much he gets paid now, he said he should probably remind his children that he deserves a raise. He says he still shows up for work “dahil baka hindi ako suwelduhan ng mga bata.” (The kids might not pay me). Get to know Mr. David Consunji and his values in this week’s episode of Bawal ang Pasaway Kay Mareng Winnie, Wednesday, 8 PM on GMA News TV Channel 11. DID YOU KNOW? The Makati skyline is a towering testament of DMCI's expertise in building.